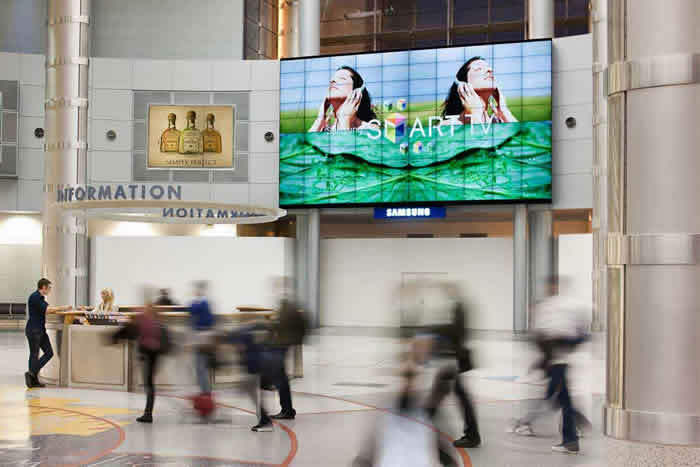 McCarran International Airport, along with Samsung and Alliance Airport Advertising, enlisted the help of Premier Mounts with a custom install of the largest panoramic video wall in a U.S. airport. The 100-screen video wall, measuring 33 feet by 19 feet, was installed at McCarran’s D Concourse rotunda. Using custom design and manufacturing, Premier Mounts designed a mounting system specific to this video wall matrix at McCarran. Expertise and superior customer service were also factors that contributed to the decision to include Premier Mounts in this collaboration between Samsung, Alliance, and McCarran to successfully complete the undertaking of this ambitious project. Shauna Forsythe, CEO of Alliance Airport Advertising, explained that the company needed a precise mounting system, with no room for error. They found that Premier Mounts would deliver that expertise. The biggest challenge was creating a full feature product that will compensate for uncontrollable and unforeseen circumstances. Due to collaboration between all parties involved, the design was adapted to accommodate the environment. The LMV features precise, three point fine-tune adjustments for display alignment. An 8 in. pullout feature allows for full display serviceability. Wall plates and built-in ventilation fans ensured maximum airflow between displays. Precision adjustments of display brackets allowed post-installation leveling and fine-tuning. The final custom video wall located in the D concourse of McCarran International Airport. Premier Mounts' engineering and design team expertly designed the video wall for a seamless digital signage display. Premier Mounts manufactured the LMV video wall framing system for the McCarran project in its high tech manufacturing facility in California and provided on-site project and installation support throughout the installation phase.